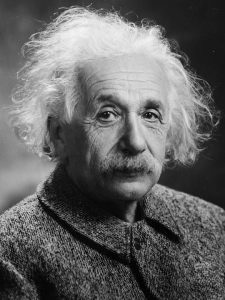 We’ve all heard about him- his name is basically synonymous with being a “genius”, after all…But who was Albert Einstein? Born in Germany in 1879, this man (and Nobel prize winner) would go on to become one of the pillars of modern physics. According to him, his fascination with science was rooted in two childhood events that fascinated him and made him what to better understand the world around him. The first event was using a compass. At the age of five, the idea that something invisible could cause the needle in the compass to move filled him with wonder. The second event in his life that steered him into his path was finding a geometry book when he was 12. His journey from a young child that loved science into the man we all know of and admire today was not an easy one. However, it is thanks to his perseverance that he was able to accomplish as much as he did. So…exactly what contributions did he make to STEM? Albert Einstein is best known for his energy formula, E = mc2, which is one of the most well-known scientific formulas in the whole world! He is also remembered for his contributions to science by developing the Theory of Relativity. The Theory of Relativity is most easily seen in our modern world in things we take for granted. GPS navigation, for example, works on the basis of relativity. A GPS can tell us where we are, exactly, by taking into account the positioning of satellites in relation to the Earth. Light and magnetism would also not exist if relativity were not a thing! It is also thanks to Einstein that the field of physics and quantum mechanics have both advanced to where they are now. As it turns out, it is thanks to Einstein and his theory that we can both better understand the world around us, and use this understanding to our benefit. While we can’t promise everyone will make as much of an impact in the world as Einstein did- one thing is worth remembering. This incredible man’s journey got started when he was just as child that fell in love with science. No story is a better testament to the importance of involving children in STEM and STEAM activities. After all, it is thanks to childlike wonder that his passion for science (and everything it led to) was ignited! This entry was posted in Spotlight and tagged Children in STEM, Einstein, STEM. I really enjoy examining on this website , it holds good blog posts.